Thanks again y’all for the warm response to the new podcasts. So thankful God can use technology to encourage moms wherever they are listening. (Here are episodes one and two if you’ve missed them). 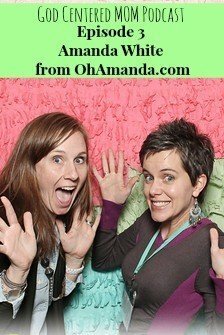 Today’s guest is Amanda White from OhAmanda.com. Of course, I love Amanda’s carefree laugh and witty banter…but even more? I love her heart for children to know God. In this episode we begin with the topic I brought up in my last post. How God can use stay-at-home moms to minister in big ways, outside the home, without taking away from the first priority ministry in the home. Even Sally Clarkson, a big proponent of the ministry of motherhood, took time to write books and host a conference. The Proverbs 31 woman described by King Lemuel’s mother, builds a field, plants a vineyard, works late into the night and early in the morning, opens her hand to the poor, and speaks with wisdom. Many of my friends serve outside the home, have an amazing hobby/business/skill, help at church or care for the needy. We all have an “AND”. If you truly can’t think of your “AND”, maybe you should spend time with God (and your husband) to consider how you can use your gifts & talents to serve God. Model for your children what it means to seek Him first. Back to Amanda…in this podcast she shares her story of how God used what was right in front of her (teaching her daughter about Jesus through the Christmas Story) for His glory. Make sure you listen to the whole episode to get a special discount code for her amazing Christmas advent curriculum…Truth in the Tinsel. Lastly, Amanda and I give tips on when and how to execute these special times with our children. Enjoy!!! Have any thoughts or questions for Amanda? Leave them here in the comments. Here’s a little reminder on how to listen to the podcast (thanks Kat for these steps!). 3. Subscribe to the Podcast – access the podcast in iTunes (click here). You can also search for it on your smartphone app (like the ones listed above) and subscribe.